Location: At 70 Mile House turn east off Hwy 97 onto the Green Lake road. Take the south (right) road at the Y just before Green Lake. Follow this road as if you were travelling to Bridge Lake and Hwy 24. Pressy is located on the south side of the road. Resorts & Campsites: A semi open BCFS campsite with a good gravel boat launch. Fishing Report: Good producer of rainbows up to 2 lbs. Viewscape: Pressy is situated in rolling terrain , forested in douglas fir, spruce, lodgepole pine and aspen. 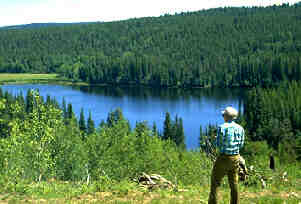 Open grassland and aspen are located on the northwest corner of the lake. Shoreline: A narrow border of alders and willow surround most of the lake. Most of the area is forest soil except for the southwest end where it is peaty soil backed up by meadow. Crystal Lake - Located on the same road as Pressy about 6 1/2 km. (4 miles) southwest of Bridge Lake. Stocked rainbows that reach upwards of 3lbs., eagerly accept flies and spinning lures. A well treed BCFS campsite with boat launching can also be found on Crystal Lake.